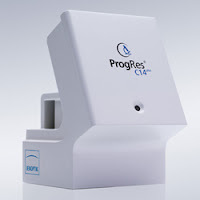 Several of the Jenoptik ProgRes microscopy cameras have a feature called Microscanning technology. This sophisticated technology allows cameras with 1.4 megapixels to deliver absolutely true-color images of up to 12.5 megapixels. 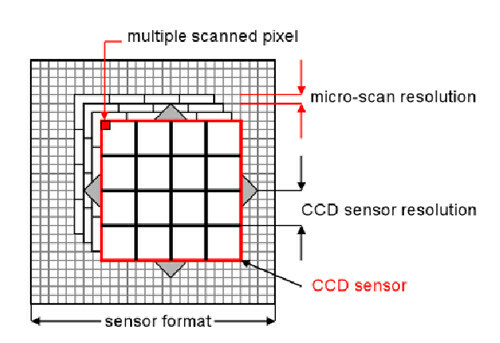 The process of Microscanning involves scanning a section by laying a series of images in fractional pixel steps across the camera sensor. These partial images are made into a composite image. Each partial image is a full field image made at a faster rate than the composite image. The resolution of the final image is increased in the horizontal and vertical directions by the number of single images taken in each direction, otherwise known as the micro-scan factor. This final image has a geometric resolution that is increased by the micro-scan factor in both directions, allowing for a final high 12.5 megapixel resolution from a native 1.4 megapixel sensor. Microscanning increases spatial resolution and color resolution, in other words you end up with more true color reproduction. Microscanning in the Jenoptik ProgRes cameras allows the image sensor of the camera to be shifted in both pixel and sub-pixel steps. This results in a more true color representation. If you have questions regarding Jenoptik cameras or Microscanning technology please contact Microscope World.